Robbi in her indefatigable pursuit of the unusual and the unique has been busy sourcing some interesting and very different accommodation during our stay in the Cappadocia region during our Turkish Aromatic Odyssey. 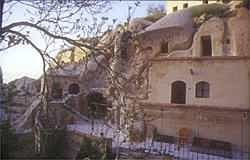 As a result she found for us an amazing, exquisitely restored seventeen room hotel built into a cave situated in a traditional Cappadocian village. The hotel is partly located in a one thousand year old Byzantine monastic retreat complete with frescoes, and offers modern conveniences without distracting from the character and spiritual feeling of the area which has been known to be inhabited for more than five thousand years. There is an underground city just across from the hotel waiting to be excavated and from our windows we will see fine examples of cave houses where ancient people once lived. We will also experience traditional Turkish village life with the women filling their water pitchers from the communal fountain and every two days the village stone oven is fired and we will be welcomed to taste the hot bread fresh from the oven. In the hotel kitchen, organically produced food is used in the preparation of typical Cappadocian style Turkish dishes and our meals will be enjoyed on a lovely walled terrace. After we leave Cappadocia, it is off to Konya and the Mevlana museum, where we will see a performance by the Whirling Dervishes and then on to the Valley of the Roses where we will pick blooms in the early morning with the warm hearted village women and enjoy the beautiful fragrance of rose essential oil being produced at the distilleries we visit.